No matter which way you go, you’ve got to SELL, SELL, SELL yourself and your book. These days, there’s a lot to be said about self publishing your own book. In fact, most of the writer friends I know have gone this route because of the difficulty, and LONG process, of being accepted and published by a royalty or traditional company. Put some hard cash up front (like, at least $1600-$2000) and hire a reputable company to print about 100-200 of your books. Many such companies will have in-house editors who’ll work with you to make sure your book is a reflection of your best writing and their fine work. As far as marketing and promotion go, as with the first option, it’s all yours, baby. Marketing your book falls 100% in your lap, which will be a costly venture, as well. Submit your manuscript to the latest craze in self publishing: “partnership” or “indie” publishing, which is becoming a very popular way to publish with small royalty companies. If you enter into a contract with this type of company, it will give you no money up front, BUT it won’t ask you for any money up front either. The company will provide editors to perfect your manuscript, and when the final product comes out, the company will also help to promote it by posting it on numerous websites, review sites, and markets like Amazon. Check out THE SECRET OF WOLF CANYON on my website www.marshahubler.com or on Amazon for this final product. Publish your book through online businesses like Amazon that use printers like Create Space in Charleston, SC. The cost can be comparable to local print shops who focus on hard copies. However, the big advantage is your books will be posted online for sale as part of the deal. The cost, as with all other print shop deals, varies according to number of pages in your book, type of cover chosen, and the number of pages that you want with color. Now, after reading this post, if you decide you no longer have the patience to wait for a royalty company to come knocking on your door and you do have the capital to proceed, then go for it. Just decide which way you want to go. And one other small but important detail: make sure you get an ISBN number installed on the back cover. Some print shops or publishing companies will NOT provide this and you must apply and pay for the number yourself. Other companies WILL do that work for you (for a fee). If you plan to try to market your book anywhere in stores or on eBay, you must have the ISBN, or your book cannot be sold through these venues. a wild Mustang that might not even exist. Before we discuss today’s topic, let me revert to something I’ve already mentioned in two past blogs: business cards. Although I’ve mentioned a frugal way to make your own with desktop publishing programs, you can also do well by watching for special deals at places like Staples and other office supply stores. 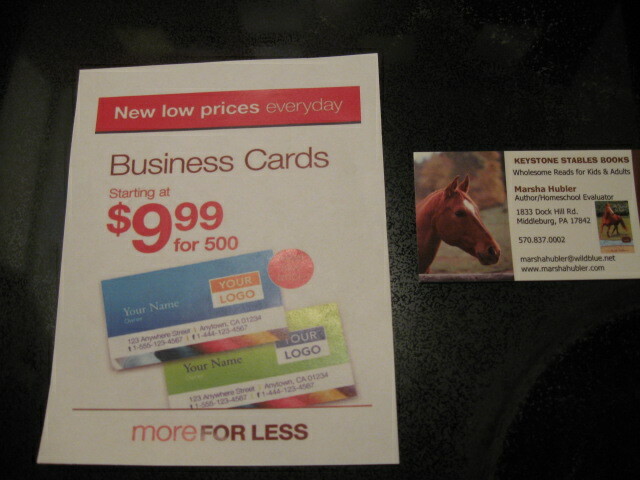 Just last week I purchased 500 cards for $9.99 on Staples’ website. After choosing one of their templates, I designed my own card, used one of their many photos, and uploaded a photo of the cover of A HORSE TO LOVE, book one in the Keystone Stables Series. I chose the closest store to my home for delivery, and in less than 24 hours (16 hours to be exact), the cards were finished and ready to be purchased at the store. I am extremely well pleased with the cards, and, frankly, at that price, I couldn’t make the cards any cheaper. So check out those special deals at office supply stores not only business cards but also for posters, calendars, notebooks, or any other “paper” you’d like to use for promotion. Now, let’s look at several of the more expensive ways to promote your books. Remember, I’ve said it takes money to make money, and when you promote and market yourself, it does take bucks. 1. 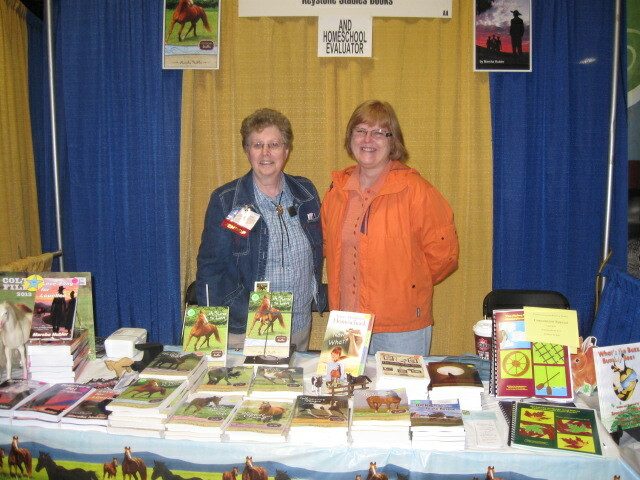 Buy a set of two or more of my horse books, and I tie them together with binder twine (used on hay bales) and include a free bookmark and a tiny plastic horse party favor tied onto the front of the set. I also void the state tax (which I cover). 2. 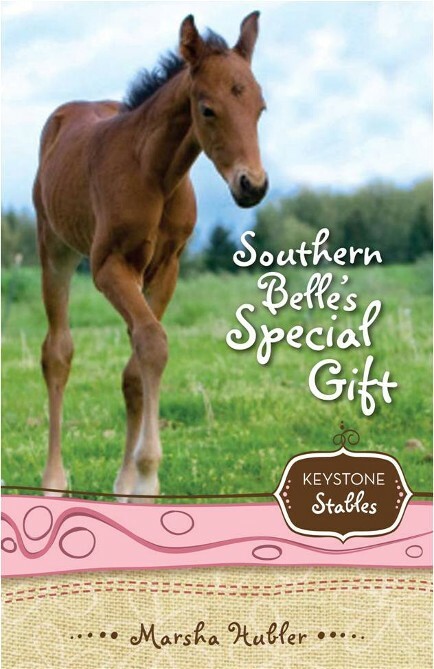 Get a nice “horsie” gift such as a horse Christmas tree ornament or one of my other horse books if you buy the entire Keystone Stables set. 3. Buy any four books on the table, get a fifth one free. The coupons go to folks who say, “I’m interested but can’t buy today.” Have an expiration date on the coupon and give them the coupon with your business card. Often, folks won’t follow through, but once in a while, someone will order. and the kids at the sleuth camp do. Today’s Writers’ Tip: Will Book Distributors Carry your Book? Before I took a social networking class to learn how to start and manage blog sites and “connect” to promote my books, I spent little time online trying to market my books. The reasons were two-fold: 1. My royalty publishing companies did most of the work, which included posting my books on Amazon and getting the books reviewed. 2. A few years ago, I had slower-than-a-snail-in-a-puddle-of-molasses dial up, totally frustrating to try to do much of anything online. But one thing I did that proved to be very successful was contact Choice Books, the Christian book distributor responsible for placing Christian books in all Wal-Marts, hospital gift shops, truck stops, and other similar places of business in much of the northeastern USA. When my first two Keystone Stables books were released, I naively went to our local Wal-Mart and asked to speak to the manager. Of course, I had this big spiel ready to try to convince him to place my books on his shelf. What I was expecting was for him to tell me that I had to contact the store’s headquarters in Arkansas. Remember, I said I was naïve (what an understatement)! He told me Wal-Mart is not responsible for placing any books on their shelves. That decision is made by distributors, the Christian books done by Choice Books, at least in Northeastern USA. Okay, I got the hint and left red-faced. I went home, went to Choice Books website, and emailed the company, telling them about my books. Well, miracle of miracles, shortly thereafter, I started to see my books on the shelves of Wal-Marts and gift shops up and down the northeast coast. How did I know the books were in more than our local Wal-Marts? Friends and relatives were telling me they saw them on the shelves. Wal-Mart carried my books for a little over a year, which thrilled me and helped make the first one a best seller. Every time I went to any Wal-Mart anywhere, I hunted out my books, autographed them, and placed an “AUTOGRAPHED COPY” sticker on the front of each one. Ask me if that was exciting. You bet cha! Wondering about the possibility of getting my books in other super stores in the area, I did some research and found that in K-Mart and other similar stores in other parts of the country, a company named Anderson does the Christian book distribution. I also contacted that distributor but had no response of any kind. They never returned my email, snail mail letter, or phone call. But I am pleased to say that one email to Choice Books helped get my books a place on some frequently visited shelves for over a year. AND…a few months ago, I scheduled a book signing at a Wal-Mart. To do that, I had to ask Choice Books again to contact the publisher, Zondervan (now owned by Harper and Collins), to supply the books, which both entities graciously did. The book signing at Wal-Mart was one of the most profitable I’ve ever had. I sold about 70 books in four hours. The manager at Wal-Mart agreed to place the left-over books on his book shelves and contact Choice Books to start stocking them in the store again. I made a point to call Choice Books and let them know how successful the book signing went. Pleased with the results, the contact person made a commitment to start placing the Keystone Stables books on some store shelves again. Shortly thereafter, I spotted two of my books on a Choice Books display in a little country store, and a few friends told me they had seen my books in businesses in several different towns in central PA. Ask me how excited I am…again! learn what responsibility is really all about. Marketing your book(s) can be a very expensive endeavor, especially hard copy printing of advertisements and promotion. 1. Flyers/posters to hand to book store managers. If you’re fortunate enough that the store carries your books, the manager is usually willing to display your attractive posters somewhere in the store. 2. 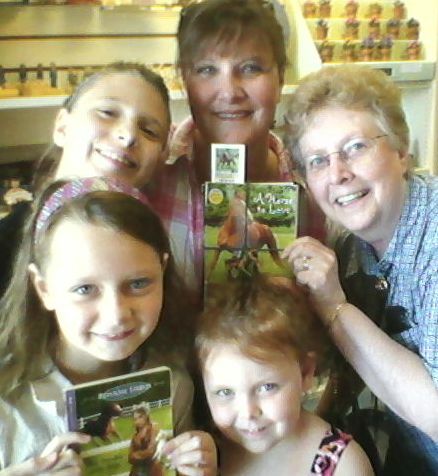 Brochures to have on your table when you do book signings or speaking engagements or to mail to prospective fans. Make sure the brochure has your name, phone number, website (and other key URLs), and email address on it. 3. Order forms: I’ve included an order form in my brochure, which features all the books’ covers with a short blurb about each one. 5. Your own letterhead for stationery featuring you as an author and a graphic of your book cover. 6. Coupons for special deals: In a previous post, I’ve already mentioned I’ve used coupons with book signings for prospective customers who are “really interested but don’t have enough money today to buy.” Give them a 10% off or free shipping coupon if they buy books by a certain deadline. You’ll soon find out who really meant that little cliché. It’s very easy to make your own coupons using a graphics program like the Print Shop. All these “paper” marketing ideas require little time and a lot of creativity to produce attractive “ads” to promote you and your book. So jump on the self-publishing band wagon and get your name in print in all these different venues. You’ll be surprised how effective this type of campaign can be, and it won’t empty your pockets. Skye has her hands full trying to teach a deaf boy the correct way to ride Western. 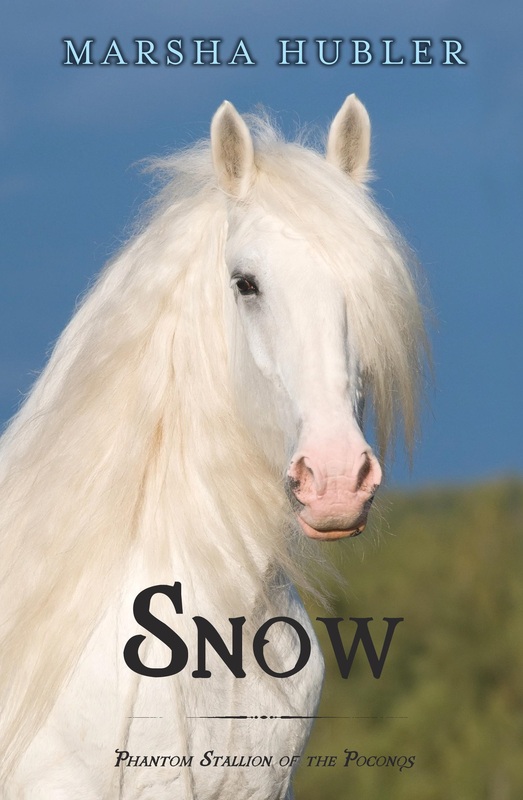 When Jonathan and a horse come up missing, Skye and Champ spearhead a search party into the PA mountains to try to find them.